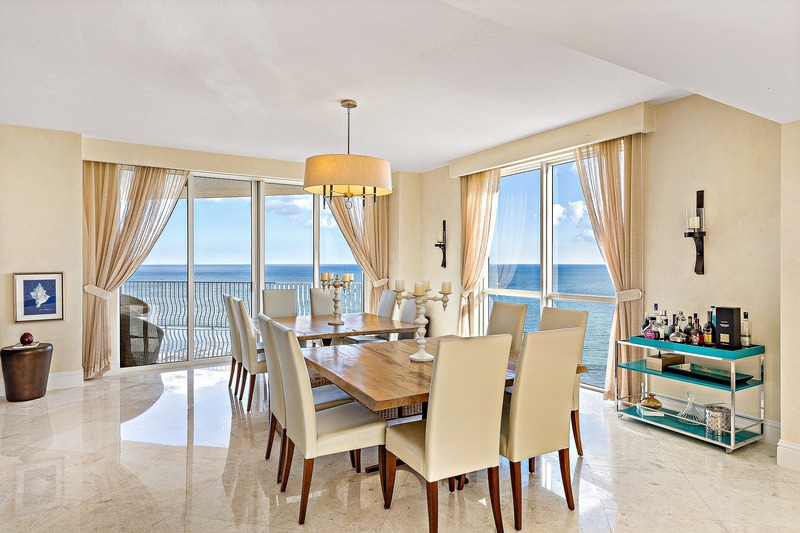 Breathtaking 5 bed / 5.5 bath penthouse residence with panoramic ocean views. This distinctive home features a private elevator entrance with custom chandelier, artisan masonry stone accent walls, marble flooring, faux finish paint, recessed lighting, floor to ceiling windows, and custom fabric chandeliers with matching lighting fixtures throughout. The gourmet chef's kitchen showcases a custom trey ceiling, granite countertops with oversized island and breakfast bar, U-line wine cooler, gas stove range, Italian handcrafted designer wood cabinetry, Míele double tiered stainless steel convection ovens and range, Sub-Zero refrigerator, stylish pendant lighting. Private master wing features separate entrance, sitting area with oversized terrace overlooking ocean, double walk-in closets, en-suite bathroom with dual showers, vanities, bidet, TOTO toilet and custom crystal chandelier. Master suite features private office space with balcony access and expansive ocean views.